On the beach experience close to downtown! Cliff Walk views and hear waves! 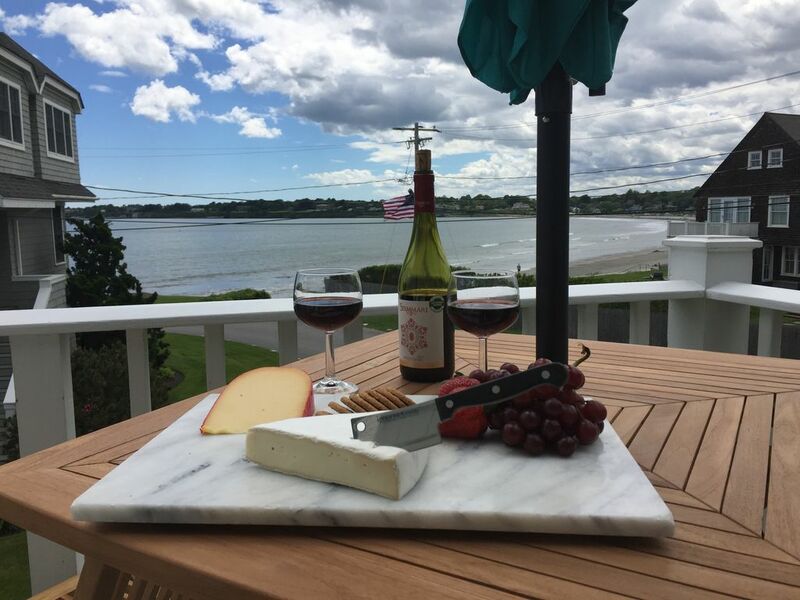 Enjoy your vacation at Surfside Cottage on Esplanade, a beautiful, modern, ocean and beachfront home on a beachfront compound overlooking Newport's Easton's Beach and famous Cliff Walk. We know you will love MyOceanFrontHome! PLEASE email to inquire and confirm rates as I may include extra nights at low rates or complimentary in the off season and I may be flexible on the rate for some rate periods. I will also consider a 1 night minimum at a premium rate. Surfside Cottage comfortably sleeps 4 couples and children. It is elevated by 18 feet because it is so close to the ocean! The first living floor has a bright, sunny open living/dining room with spectacular views of the ocean, beach and cliff walk. Perfect for entertaining! Enjoy colorful sunsets year round from the living room and deck that is right off the living room or cozy up in front of the gas fireplace in the winter and watch the smokey ocean with waves crashing on the snowy beach. Fall asleep to the sounds of the waves all year round! The granite and stainless steel appliances complete the galley kitchen which is well stocked for all your cooking needs and is open so the chef can see all guests in the living and dining areas in addition to the beautiful views of the beach. There is a bedroom on the main living floor with a queen bed, and beautiful views of the beach. A granite and glass full bathroom with step in shower is also on this floor. On the top floor the master bedroom with ocean and beach views has a queen sized bed with full tile and glass tub/shower bath. The 3rd bedroom has a queen and a twin and the 4th bedroom has 2 double beds with a full tile and glass tub/shower bath in the hall. There are hi-def flat screen TV's in every bedroom with cotton sheet, quilts and comforters. The ground floor has a garage with a door facing the off street driveway that fits 4 large SUV's or 6 smaller sedans where gas grill is also located. The other end of the garage has french doors that open to the large lawn and view of the beach. All beach chairs and supplies, games, boogie boards and kids toys along with ping pong table and small pool table are there for your enjoyment. Just bring your suitcase because this home has everything you need for bed, bath, beach and cooking for a great vacation. Please- No Smoking and No Pets. Known as 'America's First Summer Resort,' Newport, Rhode Island, is the home of The International Tennis Hall of Fame, Newport Preservation Society and Newport Mansions, The Newport Jazz Festival, The Newport Music Festival and the Newport Film Festival. This home is close to Carnegie Abbey and Newport National, known for world class golfing. RI Beaches: Easton's '1st' beach and many other RI beaches have red seaweed that travels up and down the beach with the tides. It is not 'Red Tide'. Activities: Activities at your doorstep include swimming, surfing, windsurfing, kayaking, canoeing, and sunbathing on Newport's Easton's (1st) Beach. On the rocks to the left of the beach enjoy fishing and snorkeling. Easton's Beach has a playground, snack bar, merry-go-round, aquarium and live weekly entertainment. Middletown's Sachuest (2nd) Beach is just 1/2 mile away with the best surfing in RI. Families with young children will enjoy Middletown's 3rd Beach with no waves and a boat ramp with windsurfing at the north end. Area: Just a short walk to popular restaurants and pubs including The Newport Beach House wedding venue and Flo's Clam Shack. Spend the day at the beach, afternoons sightseeing or shopping, and nights at lively restaurants and clubs on the harbor front. The property is within walking distance to Cliff Walk, Newport’s Easton’s Beach, and Middletown’s Sachuest Beach. This home is one to two miles from Bellevue Avenue mansions, and The Newport Yachting Center. It is two to three miles from major recreational attractions in Newport including Newport Country Club, Bailey’s Beach, New York Yacht Club, Ida Lewis Yacht Club, and Sail Newport Yachting Center/Fort Adams. Rates are negotiable during some time periods. Please call or email for a quote. If you need multiple homes, you can check out my other 2 homes... Homeaway house ID#'s 131374 and #102833. Email me anytime and I'm willing to discuss the homes and rental options. I have lived on this street most of my life. After I got married, I bought these three lots where I built my home and two vacation homes. It is one of the most beautiful spots on Aquidneck Island and in all of Rhode Island. We are continually updating, renovating and improving our beach homes for our guests, many of whom return year after year. I have equipped them with everything you will need for a great vacation on the beach, even in the winter with the cozy gas fireplaces. So book your week or weekend now before we sell out! My whole family has lived here within a few blocks of each other since 1930, so the memories of my childhood surround me. Swimming and surfing at '1st Beach', exploring the rocks on the point, walking to the surf store, restaurants, and '2nd Beach', walking to St. George's School where all of my daughters were educated, and watching the amazing sunsets over the Cliff Walk and big surf have been a part of my life and i would not want to live anywhere else. The Esplanade and Tuckerman Avenue area on Easton's Point is centrally located so that you are very close to downtown, both beaches, or Route 138 for a quick drive to Providence or Boston, but it is quiet and the scenery is gorgeous so that you feel as though you are at a resort on an island. Please check out our other two other homes on the same ocean and beachfront compound overlooking Newport's Easton's Beach and the cliff Walk or rent all three for your wedding or family reunion. We look forward to having you as our guests! Esplanade Rock Cottage 5 bedrooms 3.5 baths https://www.homeaway.com/vacation-rental/p102833 Easton's Seaside Cottage 4 bedrooms 2.5 baths https://www.homeaway.com/vacation-rental/p131374 Location, location, location, on a beachfront compound, 50 feet to the sand! This home is close to 2nd beach and downtown, yet away from the congestion and traffic and within walking distance of The Newport Beach House wedding venue, Flo's Clam Shack, Tickets Sports Bar, a surf and skate shop, convenience stores, coffee shops and many more restaurants. The sandy beach a few steps down the path in front of the house is great for sunning, swimming, surfing or fishing. Downtown Newport with restaurants, shopping and yachts is 2 miles away. "Half-town" on Aquidneck Ave with restaurants, liquor store, convenience store, coffee shop and surf shop is a 3 minute walk. Great beach, ocean, cliff walk, and mansion views! The house is on Newport's Easton's Beach and the beach is private in front of the compound. The views of the huge waves are spectacular during a storm! Sometimes the ocean is calm and flat too. You can see the beach and ocean from the table. Enjoy our expansive lawn with gardens and beautiful views of the beach, cliff walk and ocean. The deck faces the beach, cliff walk and ocean and is directly off the living/dining/kitchen. You can surf and boogie board in the waves in front of the house. We arrived at your "Holiday House" as our grandkids so endearing named it! We have meeting up with our children and their families at a different location every year to bring in the new year. This year we chose Newport. We were not disappointed. Midddletown is a lovely town minutes away from Newport. What an absolutely beautiful place. We were here 40 years ago, so it felt like a totally different place this time around. The house is cozy and lovely with a beautiful view of the ocean. Julie was a most gracious host. We totally enjoyed the 4 days we were here and all that the Newport area has to offer. Thanks again Julie for making our stay so special. Thank you so much for renting and for your great review Elvin. I am thrilled that your enjoyed my home with your family. I would be happy to have you return someday. My homes are in a perfect location with beautiful views of the beach that is less than 100 feet in front of the house and so close to restaurants in Middletown within a 5 minute walk and the downtown Newport wharves which are only 2 miles away allowing visitors to enjoy all that the area has to offer. Thanks again! This was a perfect spot! The views were spectacular and the proximity to the beach the best. The house was great-very clean-well equipped for just about anything. Even in winter our boys enjoyed the ping pong and pool table in the garage. The owners were warm and accommodating. We will definitely stay again in the future. Fantastic property....anything you could possibly need was provided. The location can’t be matched! Julie was absolutely wonderful to deal with all through the process. She checked in a couple of times and was sincerely interested in making sure our stay was great. We hope to return and make this a tradition. Julie, thanks for sharing your beautiful home and ensuring we had a great time! We loved our stay at 18 Esplanade!!! The property is in a beautiful location overlooking the beach with steps down to the beach right across the street and in the distance, the Newport coast mansions. The area of Middleton by the beach has several nice places to eat as well as a convenience store within walking distance from the house. There are endless things to do in the area and you can be as busy or as relaxed as you choose. The house itself is beautiful, well appointed and IMMACULATELY CLEAN. Everything is well organized and readily available. Julie provides binders with everything you need to know. If you do have a problem (we had one non-working cable box), Julie deals with it immediately. We thoroughly enjoyed our stay and would love to come back in the future. The property and the house where everything we had hoped for and more!! I will definitely be back. Julie's home is in immaculate condition-it is exactly as advertised. The home has everthing you need for your stay. She is an incredibly conscientious hostess who delivered on every detail-from early check in to immediate response time. If you are going to Newport this is the house you want-it has it all-is close to everything you could want. We were in town for a wedding so I got to check out some of the other guests houses-they didn't compare to Julie's house. Thank you so much for this awesome review Kevin! I would be happy to have you and your family return to the Esplanade. Reviews like this are what motivate me to provide the best guest services possible and a home that you would love to return to for your next trip to the area. There are so many things that can be seen and done in Newport that are close to my homes! My homes are on Newport’s Easton’s Beach. You can sit at the beach, swim, surf, boogie board, make sand castles, look for shells, explore the rocks, and fish within 100 feet of the back door. I have boogie boards, sand toys, some lawn games plus some kid’s toys, and a ping pong table in the garage. I have a swing set and plastic kiddy pool. There are many restaurants, sports bars, and a surf store within ¼ mile. Within one-half mile is the Easton’s Beach Pavilion with a skate board park, volley ball tournaments, bikes rentals, playground at the beach, carousel, bumper boats in water, Save the Bay aquarium where kids can touch marine life such as crabs a baby manta ray and other fish all caught right at the beach in front of it, a Bouncy air jumper thing like you rent for parties, Bouncy Air slide and live family entertainment every week (singers, bands, magicians and such). Historic cliff walk is a three-quarter mile walk to it that spans 3 miles with the ocean on one side and the mansions on the other. Within one mile are two other beaches, one which has surfing lessons, kite surfing, and the other has windsurfing lessons. There is Sachuest Point nature preserve with a beautiful ocean front walking trail and tons of birds, The Norman Bird sanctuary has hiking trails to a cliff with amazing views, and horseback riding stables in Middletown and Portsmouth offer riding lessons (can ride on the beach in the very early morning from October through May) all within 1.5 miles of my homes. This area is a great area to bike or run through. Within one mile is Bellevue Avenue and historic Newport where the Tennis Hall of Fame, Touro Synagogue, Newport Art Museum, The Redwood Library and many shops and restaurants are located. The Newport mansions are also on Bellevue Avenue and can be toured daily. There are also many antique shops off Bellevue to Spring Street. Two miles away is the wharf area where you can shop, dine, go to a baseball game to see the Newport Gulls (college players from all over the country) and see theater productions. There are also art galleries, antiques shops, glass blowers, an arcade game shop, sail boat rentals, scooters rentals, deep sea fishing charters, America’s cup yacht charters, schooner trips or ferry rides to Block Island or Jamestown. Then 5 miles away is the famous Ocean Drive where you can bike, drive, go to the beach, have a picnic, fly kites, watch the surf and just mansion gawk (huge homes like in the Hamptons). Three miles away in Portsmouth you can watch a polo match. There are 5 golf courses on the island, some big, some small, some famous, and some private. Then there are always the movies with three theaters with 1-10 screens. There are many festivals for music, food, and film depending on when you visit. I may have left things out, but that is just some of what can be done! Please email for all rates especially weekend rates from Nov thru April as I may be flexible-----3 night minimum in September, October, Mid April thru early June with a 3 night minimum for Holidays. Nightly rates from $350-2000 per night depending on month. $500 security/cleaning deposit required Cleaning fee $300 minimum Rates negotiable under certain circumstances by phone only No weekend rentals in the high summer season from mid June thru mid September For the comfort of our guests we do not allow Pets or Smoking Please check out my other homes on the same ocean and beachfront compound HomeAway #131374 4 bedroom/2.5 bath HomeAway #102833 5 bedroom/3.5 bath Rates and minimum rental nights are subject to change at any time. I have a no cancellation policy. I will try to re-rent and will refund the actual amount of funds that I am able to get for the cancelled period.